“The back yard of Saorise and Daisy’s house can be a perilous place: boys from down the road leave unwelcome ‘presents’ at the gate, the girls’ father comes home late with a swollen jaw, and they have to rush indoors and shut the windows tight when marchers pass, even on the hottest day of the year. And while there is respite to be had at Antonini’s Ice Cream Parlour and in their mother’s bedtime stories, the walls of the house cannot protect this family for ever, and when a tragedy occurs at its heart the fragile ties that bind them together begin to break apart. Ten years later in rural Ireland, Saoirse is building a new life for herself. She is dreaming again: of her prom night, of her future, and of the wayward but handsome Johnny Mahon. But, as she learns to her cost, she has still not fully escaped the fallout of that unforgettable Belfast summer a decade before. As her past, present and future become inextricably tangled, Saoirse is forced to confront her family’s demons, if she is ever to begin a new life of her own. Where They Were Missed is a heartbreaking story of domestic tragedy and the loneliness of suffering. In a world where everyday violence taps on the surface of people’s lives, Lucy Caldwell evokes the pain of an incomprehensible loss, as she charts a young girl’s search for forgiveness. Where They Were Missed was published by Viking in March 2006. It was shortlisted for the Dylan Thomas Prize and the Waverton Good Read Award. 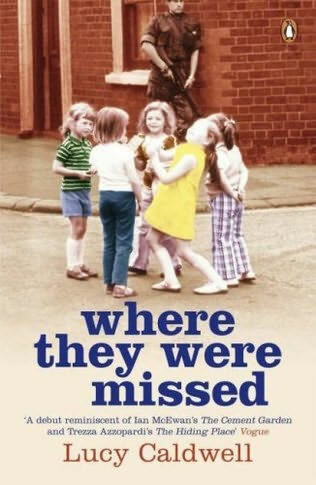 Where They Were Missed is a work of the highest order: unsettling, unflinching, but finally uplifting. Lucy Caldwell’s touch is both fresh and assured. Here is a literary star in the making. A debut reminiscent of Ian McEwan’s The Cement Garden and Trezza Azzopardi’s The Hiding Place. I can think of few novels written by an author in her early twenties which are as accomplished as this one. It is difficult to do justice to the remarkable nature of this novel, so searing in its presentation of naked sorrow and so moving in the heroine’s courage. An assured and arresting tale… A heartbreaking and evocative story… A refreshingly different novel about the Northern tragedy and its ongoing effects on ordinary people. A spirited work, for all its sadness, and written with insight and economy.